Freudenberg presented technical innovations from the world of interlinings at the fashion show in Heidelberg. Weinheim, June 6, 2014. More versatility, more flexibility and more individuality: Using interlinings as a stylistic and functional element in garments brings a whole new range of options for fashion designers, giving them greater creative leeway. Fashion-conscious customers benefit from this variety of new options. Moreover, interlinings bring a perceptible increase in personal comfort, even under challenging climatic conditions. 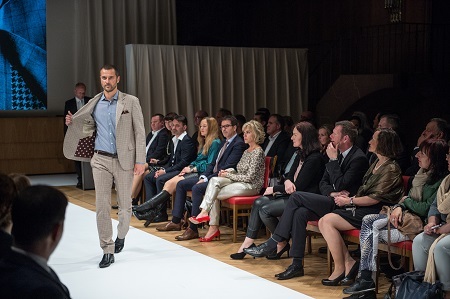 The fashion show organized by Freudenberg Interlinings in Heidelberg on May 3, 2014 highlighted the extent to which interlinings have made a name for themselves in the garment industry. The response was impressive. Some two hundred guests gathered in Heidelberg Castle at the company’s invitation. Freudenberg customer and partners, designers and managers from internationally renowned fashion labels and clothing manufacturers came together for the presentation of the latest interlinings and to swap information on current looks and trends in the fashion industry. 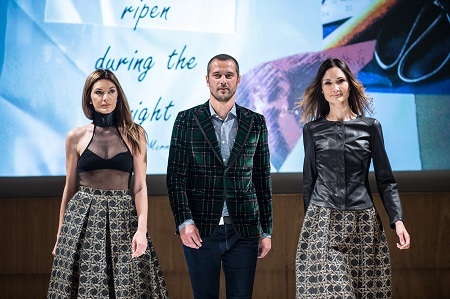 For them, the fashion show was not only a vibrant source of inspiration but above all the opportunity to gain a speedy insight into the options for using the current range of Freudenberg interlinings. Technical innovations in the interlinings industry have always been the basis for expanding existing collections, creations and stylistic devices. That was also a clear message from the event at Heidelberg Castle. The guests included leading members of IACDE (International Association of Clothing Designers and Executives), who were in Heidelberg for the annual IACDE World Convention. Freudenberg’s voluminous nonwovens, which have a quality very similar to down, are used as padding in winter jackets and create an ingenious combination of stylistic versatility and wear comfort. 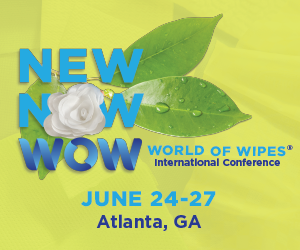 Apart from their eco-friendly production, voluminous nonwovens are light, have a long product life and extremely soft handling; they also hold warmth well, which makes them especially suitable for winter clothing. Bi-elastic interlinings (XB) offer a similar combination of benefits. Garments must be comfortable, which is why the fashion industry is increasingly turning to elastic outer fabrics. The garment keeps its shape thanks to an interlining that adapts to the outer fabric. The specific properties of the XB 6133 interlining are key to wear comfort, in particular the long-lasting multi-directional elasticity of the interlining. At the same time the material offers protection against cold and wind. The outer fabrics used in fashion collections often change and that presents a special challenge for interlinings. The patented, improved-performance Power Dot adhesive mass in the new XA series for fast-changing outer fabrics ensures excellent bonding on all of these materials. Nowadays, printed interlinings – which replace the actual lining of a garment – are much more than just a fashion accessory. Printed interlinings transform “invisible” linings into individual style statements. Laminating the outer fabric, interlining and print transfer paper creates a double-sided compound that is particularly well suited for use in unlined jackets and coats as well as pants and skirts. The excellent finishing quality and brilliant colors speak for themselves. A garment often only acquires its fashionable look once it has been sewn. It undergoes as many as 20 different processes before it is sold. The interlining must also be resilient to processes such as dying, bleaching or printing and should be suitable for use with many different outer fabrics, bond well and withstand heat and cold without deformation. Interlinings from the X!treme post-processing range are extremely durable and can withstand the effects of high temperatures and high mechanical stress. It is precisely this high processing quality, alongside its versatility in applications for the fashion industry, which accounts for a steadily growing share of the apparel market. Photo: Freudenberg presented versatile interlinings for greater individuality for garments.